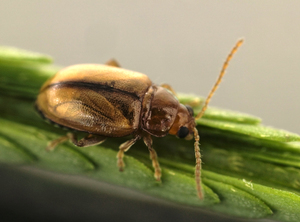 The mimosa flea beetle, Nesaecrepida infuscata is the latest biological control agent to be introduced in the fight to control the environmental weed Mimosa pigra. Mimosa was introduced into Australia in the late 1800s as a curiosity, and is now a serious weed of northern Australian wetlands and floodplains. Since 1983, 12 insects and two fungi have been released to help control mimosa, and a recent study showed that the four most effective insects have reduced seed rain and soil seed banks by 90 per cent. The mimosa flea beetle was specifically chosen to fight mimosa in the tropical wetlands because its larvae feed on mimosa roots and the soft tissues of seedlings, often killing them. Adults feed on the leaves. These parts of the plant are relatively untouched by current agents so this beetle should put mimosa under even more pressure.